Broadway’s Best Party is turning up the volume to ten! The Rock of Ages Tenth Anniversary tour is blazing across North America! Nominated for five Tony Awards, including Best Musical. Featuring the music of bands such as Styx, Poison, Twisted Sister, and Whitesnake among many others, this Tenth Anniversary production features a dynamic new cast revisiting the larger than life characters and exhilarating story that turned Rock Of Ages into a global phenomenon. Join us for the 6:40 Series Monday at 6:40 PM in the Studio Theater as guitarist Mark Sasser discusses rock music in the 80s. Mark Sasser is a Columbus native who was raised in a musical family – his mother was a church pianist, his sister sang in her high school chorus, his cousins pursued careers in music. Mark became serious about playing guitar at the age of 14 after seeing a Van Halen concert at the Omni in Atlanta in the summer of 1981. Since that time, he has played a variety of styles including rock, heavy metal, blues, country, and gospel. He is passionate about music and plays, in part, because of its ability to bring people together and add joy and enjoyment to their lives. 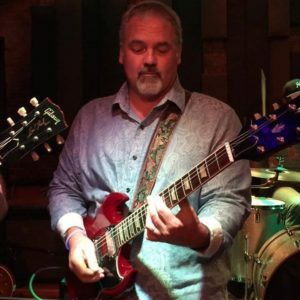 In addition to his passion for music, Mark has worked in ministry within the United Methodist Church, offered guidance and support to those in recovery from addiction, and dabbles from time to time in travel. Mark lives with Paula – his wife of 31 years, and has four grown children and ten grandchildren. You can hear Mark and his band HEAVY BLUE playing out at several area venues and find more information at his Mark Sasser Music page! Free parking is available in the parking garage which is located directly across the street from the RiverCenter on Broadway. The parking garage has a total of 685 spaces with 13 handicap accessible spaces. Additional street parking is available around the block of the RiverCenter. There are 8 handicap accessible spaces on Broadway and a total of 62 parking spaces around the RiverCenter. Rock of Ages contains some adult humor that may not be suitable for all ages.